Memory Lane Friday is a weekly blog carnival where you can blog about your memories and link up. All are welcome! This week theme suggestions are no theme - blog whatever - or blog about your father. I'm going to continue from my grandfather's memoirs this week. These are his words, not mine. You can read the previous post from him HERE. The farm on which we lived was own by the Tobe Taylor family. Our Dad was a tenant on this farm. The log cabin, which was our home, was also owned by the Taylors. Our next job was cutting briers and weeds on one section of the Taylor farm. It was late summer and harvest time had passed, so after school each day we would concentrate on clearing the large field, which was located over the hill from our house and facing the Barnett section of the Old No. 19 Highway. Mr. Taylor gave us five dollars, two-fifty each, for completing the job. This was big money for us in those days. Using a scythe, for many hours at a time, was a tiring job. What did we do with all this money? Well, we knew the county fair was coming to Lebanon in a very short time, so we began making preparations to attend. We had the money, two-fifty each, but we needed a ride to and from the fair. Joe Leonard, our first cousin, owned a T-Model Ford. We found out that he planned to attend the fair, so he consented to take us along. What a trip! Three flat tires, and ever so long to get from Barnett to Lebanon. Our first county fair and was it exciting. Lots of amusements, and plenty of popcorn and ice cream, which was a real treat to us, or should I say luxury. Then there were the hobby horses, and the ferris wheel that attracted our attention. We chose to ride the ferris wheel first. Once we were seated and had made several rounds, we found ourselves stranded on the very top. The little gas engine had completely conked out. Time passes, and still there seems to be no way the troubled engine could be fixed anytime soon. Jimmy became restless and impatient, he doesn't like the idea of being stranded in mid-air. So what does he have in mind as he squeezes out form under the cross-bar, which was used as a safety precaution? He stretches out those long arms and legs, and begins climbing down seat after seat, until he is three or four from ground level, then swings out and jumps the remaining distance. This was ever so dangerous. Well, I just sat there scared that he would seriously hurt himself. Such a dare devil venture! Later the engine was repaired. I was glad to plant my feet on solid ground once more. The ferris wheel operator was terrified. He really chewed out my brother Jimmy. I do not recall that we ever told our parents. I was so thankful that he was not hurt. Want to link up to Memory Lane Friday? Just add your website to the linky. Please take the time to visit fellow bloggers who have linked up, and leave them a comment. Next week the topic suggestion is 7th grade (themes are just a suggestion - you can always blog about any memory you'd like and link up). "Two Bears Farm" has been included in this weeks Sites To See. I hope you like the image I featured, and I hope this helps to attract many new visitors here. I bet the ride operator and Jimmy were scared. If he wasn't scared, he should have been. What a frightening memory! I can't believe he climbed down! Holy Smokes! I'm afraid of heights and would have been terrified!! 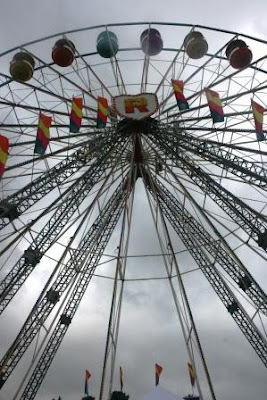 This is why I never, NEVER ride the ferris wheel at our fair! Your grandpa and mine should have met-they both had equally exciting adventures! I'll have to post some of his memoirs too. Wow! He actually climbed down from the very top! No wonder your grandfather was afraid for his brother! A definite daredevil, indeed! Thanks for sharing more of your grandfather's memoirs! They are fascinating and a delight to read. That is one of my greatest fears! I would never try to climb down though :) Thanks for sharing and I linked up my memory today too!! What a great story!! But were model T's around that late? It was probably a good thing that you didn't tell your parents! Did you ever? Oh my goodness! And this is the number one reason I won't ride a ferris wheel. That- and I'm always scared it will blow over. I think I'd lose my cookies stranded on that thing! I might just climb down if I were stuck!